Around Christmas time last year I wrote a post with a list of a few of my favourite gift ideas for travellers. 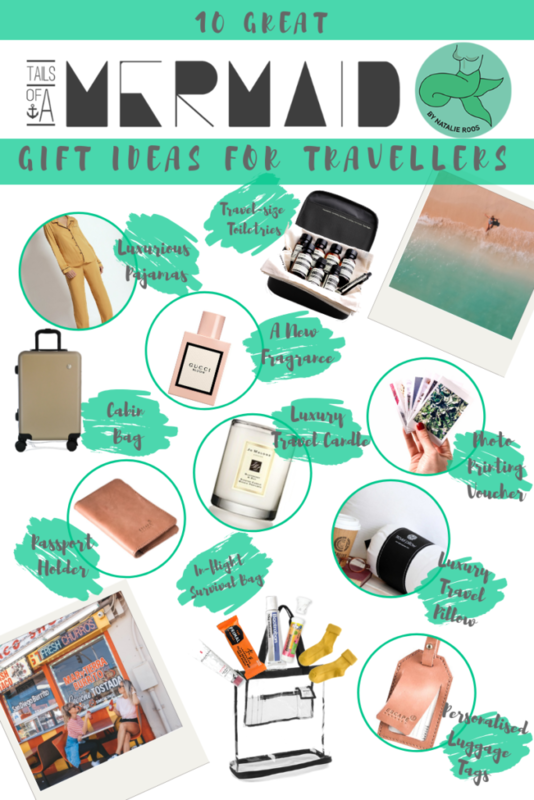 But since any time is a good time to gift someone you love, and because you guys often ask, I thought I’d do an updated version with a couple of new items I’ve found which would make the perfect gift for the traveller in your life. Any traveller knows that getting into your favourite pair of pj’s at the end of a long day of flying or sightseeing is really one of the best parts of any trip. Bena is a South African brand, so your traveller will have a little bit home wherever she goes. Travel can really knock your skin and hair, so carting your favourite products around the world really is quite essential. The Boston Kit from Aesop contains a selection of their best unisex travel-sized products. It comes in a stylish black travel case and can turn even a grimy Airbnb bathroom into a little luxury on your travels. I try to buy a new fragrance for every big trip, so that long after I’ve returned, the scent can take me back to a favourite travel memory. Scent is such a powerful way to make memories, and I can easily be transported back to a place or a moment thanks to a whiff of one of the perfumes in my collection. My guide to packing the ultimate carry-on should cover all your bases when it comes to being prepared for long-haul flights. Having a great cabin bag, complete with its own built-in mobile charger, really helps keep things easy and breezy. And the fact that it looks so great doesn’t hurt. If you’re just looking for a little luxury to gift someone, a passport holder is perfect. Escape Society allows you to personalise your leather passport holder with the initials or name of your traveller, which makes it even more special. Depending on the kind of traveller, this gift could take their travels to a whole new level. I love life’s small luxuries and can’t think of anything better than having a beautifully scented candle which I can light first thing to make my room smell more like home. It’s a great way to start your morning too – spending a couple of minutes being surrounded by a beautiful scent while you apply your makeup. We spend so much time taking and sharing beautiful pictures when we travel and not enough time appreciating them when we get back. That’s what I think, anyway. Gift your favourite traveller with a voucher for Nifty250 so that they can print their favourite travel pictures and look at them whenever they feel like it. There is just no way I could survive a flight without my travel pillow. I would probably burst into tears if I ever sat down for a long flight and realised I’d left it at home. A travel pillow from Granny Goose would make any traveller dream of you. It’s filled with Snow White Duck Down and covered with a 300 thread count pillowcase. It comes rolled up in an embroidered tog bag and is small enough to fit in a briefcase, but puffs out in to a generous 38x51cm pillow when you take it out. Adding something personal to your favourite traveller’s luggage while they’re not looking is a sure-way to start the waterworks. A set of personalised luggage tags slipped onto their bag just before they leave is a sweet way to make sure they miss you even more while they’re away. Complete with a mini dry shampoo, Bactroban, Airmune, Rehydrat, a warm pair of socks, a mini hand sanitiser, a lip balm a few healthy snacks and a couple of sheet masks inside a clear bag is a sweet and thoughtful gift that will help your favourite traveller survive their flight looking and feeling their best. So next time you’re stuck thinking “what’s a nice gift I can give my friend for her travels?” and you don’t think another travel journal is going to cut it, I hope you come back to my guide and find something your favourite traveller will love! © 2018 Tails of a Mermaid. All Rights Reserved.